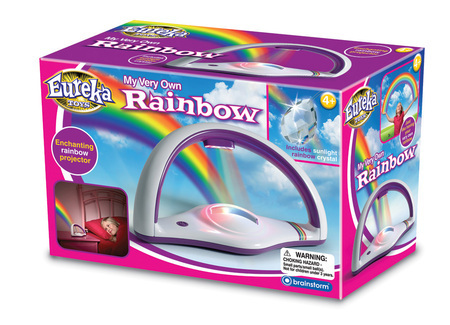 I have produced a rainbow fact sheet and supporting activities for this enchanting rainbow projector, developed by Brainstorm Toys. It displays a rainbow on walls or ceilings in a darkened room so you can transform your room into a magical and colourful wonderland. You can access the fact sheet and activities using a secret code, sold with the product. I use the My Very Own Rainbow projector for some of my school workshops. Here’s how it works: this captivating light projector uses multi-coloured LEDs contained deep within the projector’s arc to shine their light towards a unique reflective surface, diverting and beaming it high onto the nearest flat surface. The Rainbow comes complete with 2 modes, one which turns the whole multi-coloured light show on at once and the other which fades the rainbow in and out. 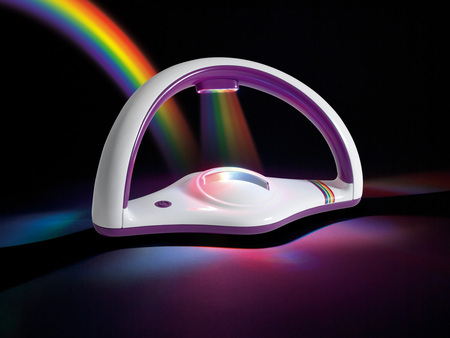 Includes an auto shut off mechanism to help preserve battery life, making the Rainbow a perfect night light. 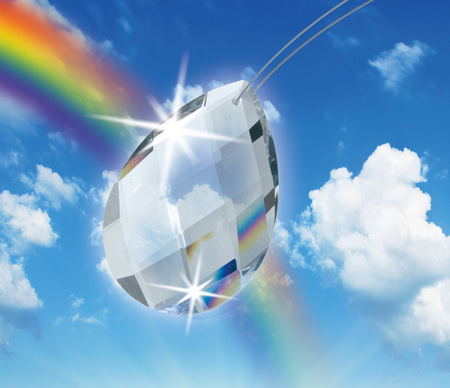 The top light emits white light (not rainbow light as suggested by the artist’s impression photograph) this lands on a prism and is refracted into the rainbow spectrum, which is then projected (as shown accurately in the photograph). Includes a sunlight crystal for daytime rainbows. Hang the crystal on a sunny window and watch sunlight make natural rainbows dance around your room. For age 4 and above. You can also read fascinating information about rainbows in the colourful educational booklet. 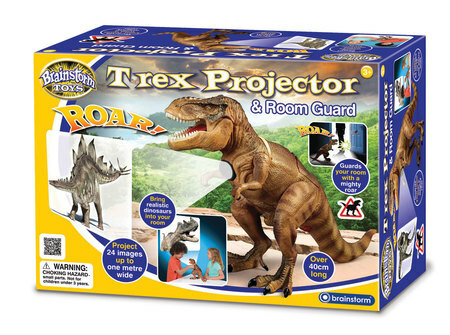 The T-rex Projector and Room Guard is part of the Brainstorm Toys range. I have produced 18 educational online dinosaur fact sheets to support the projector. This product is used to stimulate school workshops, such as producing a class encyclopaedia or writing non-fiction books about dinosaurs. Ideal for National Non-Fiction November. At over 40cm tall, this high-quality T-rex shaped projector projects 24 different images of 18 dinosaurs onto walls including, Stegosaurus, Diplodocus, Brachiosaurus, Triceratops and many more. The images can be projected up to one-metre-wide and you focus by moving the T-rex’s arm. With three discs each having eight different images and a hidden storage area on the back of the T-rex to keep them safe. Just select the chosen disc, insert it into the shoulders of the dinosaur and rotate to select your favourite dinosaur. There is also a built in trembler alert and motion sensor to detect movement and set off the five different mighty roars. Includes a T rex wall or door sticker and a secret code to unlock bonus online dinosaur facts. For age 4 and above. 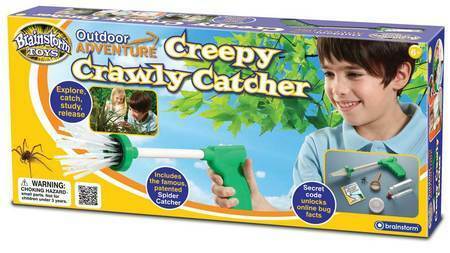 The amazing Creepy Crawly Catcher from Brainstorm Toys forms part of the Outdoor Adventure range and comes with a secret code to unlock bonus online bug facts, which I have written. I have used this resource as part of my school workshops exploring the playground with groups of children and finding bugs to observe and use to create non-fiction class bug fact file. 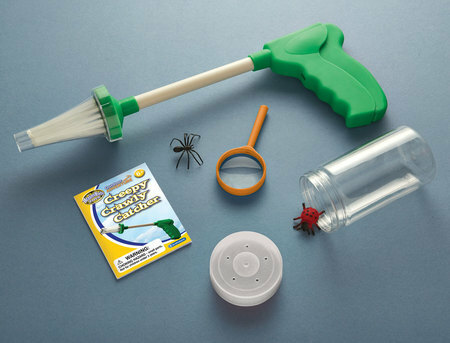 The Creepy Crawly Catcher works by surrounding the bug with bristles that close around it and harmlessly trap the bug allowing you to pick it up and place in the catch jar. 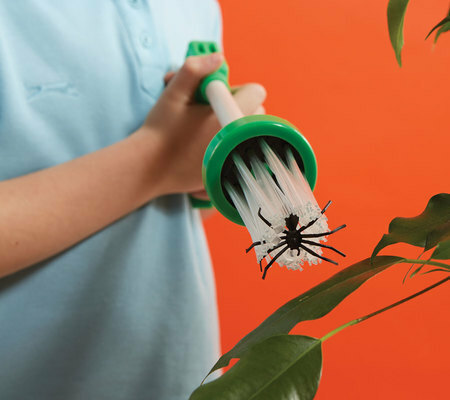 Its gentle bristles even allow you to catch bugs when they are moving without harming them. It is then possible to study them in the bug viewer and hand magnifier. For ages 6 to adult.